Yogi Amandeep tells a story: “Once, a seeker asked, ‘How do I learn to love?’ The sage answered, ‘Sit with lovers.’” This means we learn to love simply by being near those who love. In the yoga world, we call this Sangat, sitting with like-minded spiritual seekers, like those we share experiences with at Sat Nam Fest. Here are companions who love to seek. Here are companions who love to meditate. Here are companions who love for the sake of being lovers. Our practice is strengthened when we walk with our companions and our lineage. Yogi Amandeep will link you to Yogi Bhajan. He will link you to Guru Ram Das. He will link you to Baba Siri Chand. 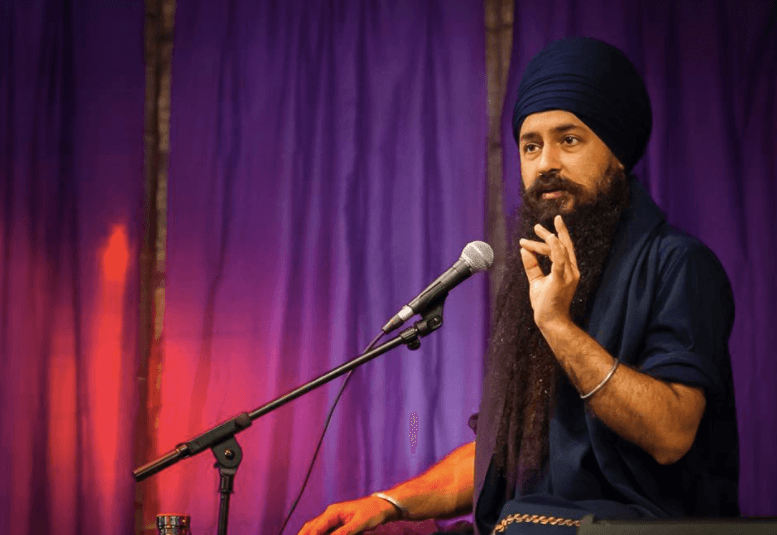 An experience with Yogi Amandeep is not just an experience with Yogi Amandeep, but an experience with a whole collective of wise souls, sages, and saints. His presence is expansive and will hold and support you to feel your own true wisdom. He guides yogis as he was guided by those who taught him. One workshop with him can give you a feeling of journeying through eons of yogic history. Its power reaches beyond words. Yogi Amandeep: “We are all one. There is no difference between you and me and we. When we sit and meditate together, even if just one person among us experiences enlightenment, we all experience enlightenment. Truth is simple. Start every act with the sound current. Inwardly chant a mantra. Synchronize the breath with mantra. Synchronize your life with mantra. This is how we can create a yogic space — continually repeating a sacred sound. Bring mantra into your every act, your every thought, your every projection. Do this and your consciousness will dance, your awareness will whirl, your whole being will radiate the consciousness of that mantra. The primal space of consciousness — the infinite emptiness that contains everything yet nothing — is the same within every being. When we come together to practice, we easily and quickly achieve a state of oneness. This oneness can help us to nurture that child-like consciousness, what the Zen masters refer to as the Beginner’s Mind. Too often we take ourselves and our practice way too seriously. We forget that we are supposed to approach our practice with innocence and glee. For instance, consider a child sliding down a slide at the playground; he simply slides for the spontaneous experience of sliding. Similarly, we can meditate for the spontaneous joy that meditation offers. Sat Nam Fest: Will you please share your wisdom regarding chanting So Purkh to attract a soulmate? Yogi Amandeep: “Attracting a soulmate? Well, now this is definitely a matter that we take very seriously. Really, it’s simple. You are your own soul’s mate. The creative consciousness within each being is that being’s soulmate. It’s true that chanting So Purkh can support the men in a woman’s life on their spiritual journey. So Purkh can also conjure the presence of God in a woman’s life. She might see him in the form of a man, but she can realize that the male energy within her consciousness is the soulmate that she continually searches for. Her search for a soulmate has less to do with finding a companion, but has everything to do with the beauty and perfection of the process of searching, that pure state of longing. A woman’s prayer is powerful, but a woman’s prayer when she is in search, when she is longing, is even more powerful because her prayer is accompanied by the energy of the search. Those are the real companions: Prayer and Longing. Prayer and Longing are the lovers. Then, in this devotional state, when she engages in chanting So Purkh, she can synchronize her mind with the Naad, the sacred sounds of the primal divine creative energy. She can go into ecstasy and feel the Beloved’s heartbeat within her heartbeat and within the heartbeats of all beings. She can totally synchronize every beat of her being with the beat of the Primal Being. Her soul will be at peace. So, a woman who chants So Purkh can anchor her being with the Naad of the Beloved’s heartbeat. 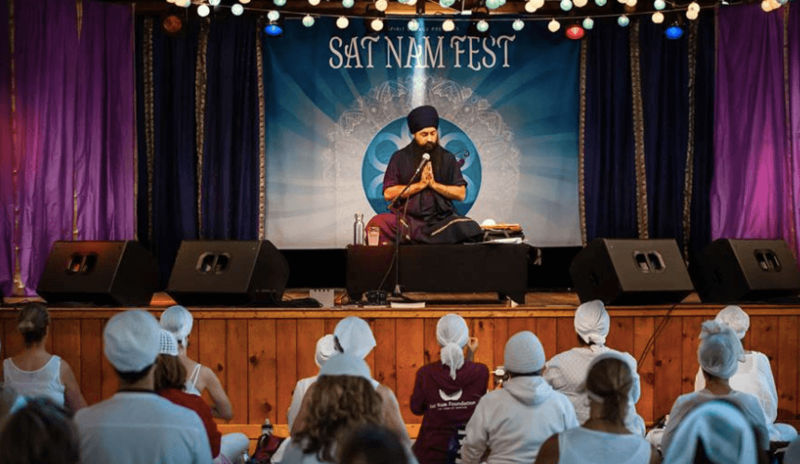 At Sat Nam Fest East, Yogi Amandeep will teach two workshops: “Adi Shakti: Awakening the Feminine Energy and the Human Will” and “Baba Siri Chand Naam Yoga.” Join our Sat Nam Fest Sangat, vibrate in group consciousness, and enjoy these workshops, which will give you a direct connection to a remarkable yogi who has shaped the Kundalini Yoga lineage. If you would like to learn more about how you can spend time sitting in a Sangat of lovers and seekers of Divine Love, Yogi Amandeep invites you to visit Makingofayogi.org.